LL tagged this issue as 'critical' so I am a little bewildered as to why a fix for this hasn't been out yet. Therefore, you're all getting helicopter updates this weekend. The Alligator, Hind and Black Hawk are done, the Viper and WAH-64 are next. And the six of you who read the update notes and manuals will notice that you can turn off the anti-littering self-delete by selecting"AutoDel" from the options menu. This option is intended for those who wish to display the aircraft on land they lease or group owned land, where they are not the technical landowners. This feature will be coming to the land vehicles shortly as well. As was brought to my attention, some OCS vehicles were registering damage upon sim border crossings. After investigating this issue, I determined that the vehicle was colliding with the pilot themselves upon crossing, which is obviously unwanted SL physics behaviour, and filed a bug report with Linden Lab. They have been able to reproduce this bug, categorized it as "Major" and have triaged it to MAINT-3517. So a fix is on the way. I'll update this when I find out when it will be deployed, most likely to the RC channels first. Hi All! Just wanted to write a few words about why the site and some services such as OCS in Second Life have been flaky the past couple of days. Our web server had a bit of a problem yesterday (Monday, July 15) that took approximately 10 hours to resolve and get everything back up and running again. This took down both the site and services, unfortunately. We are also working on migrating the current site to new software, so there may be periods of time where the webpages are not accessible, but services (such as OCS) remain functioning normally. Sorry for any inconvenience or confusion, and thank you for your patience and understanding. As you may have heard, Second Life has taken polygon mesh modelling out of beta and spread it far and wide across the main production grid. Huzzah! We at TOC have been waiting for this for what feels like forever. So, I wanted to take a moment and keep you all up to date on what we're up to. First and foremost, we have imminent mesh releases for not one, but two brand new products. Beta testing is starting on these, and if the debugging gods smile kindly upon us, the first should be released in a couple of weeks. Second, I have been fielding some questions about updating the existing product line to mesh models. The answer to this is nuanced, so read it twice. For most models, converting to mesh provides no real benefit in aesthetics or functionality. However, I would like to go back and remodel those what I feel would benefit from the capabilities of mesh. Rebuilding these models in mesh is going to take a bit of work and time, and I'm allergic to doing work with no hope of ever being compensated for it. Current thinking is that for models that are simply updated to mesh (i.e. not re-scripted and basically rebuilt from scratch) is to provide them to existing owners on a "Pay what you like" basis, in the hope that this will satisfy both customers' perception of value, and my perception of compensation for effort. And now the bad news. Sorry to all you older viewer users, but mesh requires a viewer that supports mesh, which at the time of this writing, means either the official Second Life viewer version 3.0 or the Firestorm viewer which has also added mesh support (though not upload) with its latest release. Currently, I'm using Firestorm because I'm stuck in my ways and like the additional features, familiar UI feel and mix of some of the better ideas from Viewer 3. 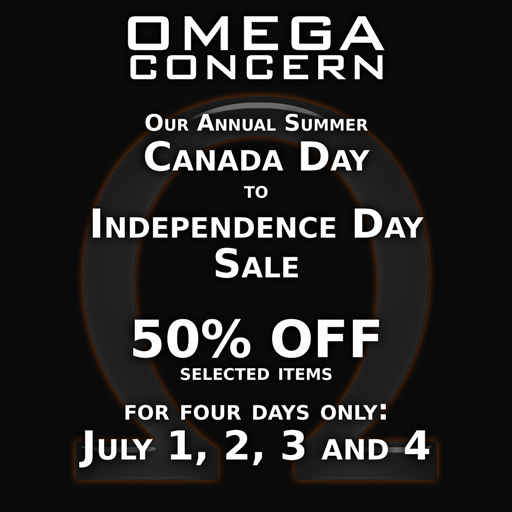 It's our annual Canada Day to Independence Day sale! From July 1st to July 4th, you can save 50% off (almost) everything at our main store.